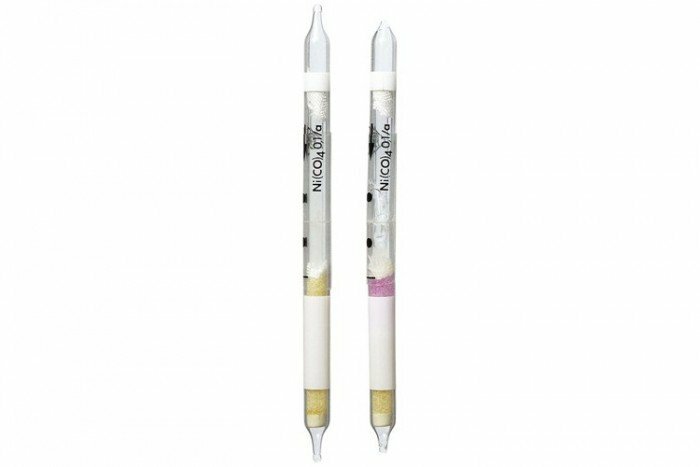 These Drager short-term detection tubes are for Nickel Tetracarbonyl (0.1/a). They detect a range of other substances including Iron Pentacarbonyl and Nickel Carbonyl. Please note they have a shelf life of 2 years and come in a pack of 9 tubes. Iron pentacarbonyl is also indicated by a brownish discoloration, however, with less sensitivity. Measurement of nickel tetra carbonyl is not possible in the presence of hydrogen sulfide of sulfur dioxide, since the reading is suppressed. Such a disturbance can be recognised by decoloration of the indicating layer even before the reagent ampoule is opened. After performing the required 20 pump strokes the reagent ampoule must be broken and the liquid carefully drawn onto the indicating layer using the pump.